Creative Nightscapes specializes in the design and installation of all types of low voltage lighting systems. We also service and maintain all of these systems. 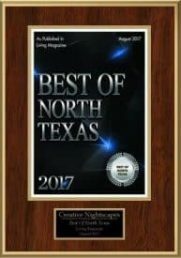 Creative Nightscapes is proud to provide these services to customers in Garland, Texas and all throughout the DFW area. Our company was founded by University of North Texas graduate Patrick Cheatham, who launched Creative Nightscapes from his garage in 2004. Patrick points to his passion for landscape and beauty when asked why he wanted to go into the lighting business. Since the beginning, our company has always aimed to make the experience of designing and installing lighting enjoyable for our customers. We have completed more than 4,300 lighting projects, and we have worked hard to exceed our customer’s expectations each time. Creative Nightscapes completes all projects with the help of an in-house team of designers and lighting installation professionals. We maintain every system we install without the help of subcontractors, and we offer one of the best warranties in the business. Creative Nightscapes has been honored as “Creative Nightscapes Landscape Lighting Contractor of the Year” for four of the six most recent years by Kichler, a top outdoor lighting brand. We also maintain active memberships in the Association of Outdoor Lighting Professionals and the BBB. hts. With our help, you can bring your vision for the exterior of your Garland home to life, adding beauty and enhancing the safety of your property. If you have a patio, you want to be able to enjoy it in the day and at night. Creative Nightscapes patio lighting solutions can ensure that your patio remains well-lit at all times so you can get the most benefit out of this space. Lighting in your Garland home’s garden allows you to enjoy this part of your home even after the sun goes down. A variety of types of garden lighting are available from our company, and we will help you choose the lighting options that are best for you. Poorly lit homes are ideal targets for intruders, but Creative Nightscapes can help you keep your home safe. Whatever your goals for security lighting may be, we will help you design and implement a suitable plan. When you have a pool, you want to be able to use it safely at all times. The right type of poolside lighting ensures that you can use your pool after dark without worrying about accidents. 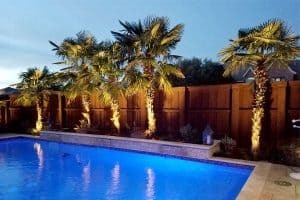 This type of lighting will also enhance the beauty of the space around the pool. 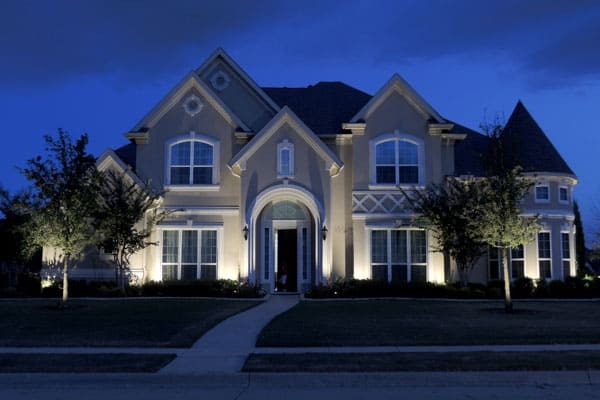 We are proud to provide LED lighting services to clients in Garland and the surrounding area, including Richardson, Rowlett, and Plano. Please contact Creative Nightscapes today to learn more about our services or to schedule a consultation. Installed Kichler LED outdoor lighting at home in Greens 4. Placed up lights to accent tree canopies. Set path lights and wash lights to illuminate walkways and landscape greenery. Installed Kichler LED lighting at home in Hills of Breckinridge. Placed up lights to accent columns of front porch, peaks, second story facade, arch and dormer over porte cochere, and various trees. Set path lights to illuminate walkway and landscape greenery. Mounted down lights in trees to create moonlight effect and illuminate deck, steps, and yard. Installed Kichler LED outdoor lighting at home in Provence at Firewheel. Mounted down lights in arbor to illuminate seating areas and waterfall. Placed up lights behind pool to accent trees. Set wash lights in landscape beds to accent landscape greenery and cast shadows on fence.